The idea of the tooth fairy is a magical experience for many children who enjoy waking up after a lost tooth to see what was left for them. Though the most commonly left item is money, we’d like to share a few other tooth fairy ideas that your child may enjoy in exchange for a lost tooth that won’t break the bank. Instead of leaving money behind, consider writing a note to your child from the tooth fairy with tips for keeping their teeth healthy. You can also find a downloadable tooth fairy certificate online that you can print out for your child. Though we wouldn’t advocate for regular sweets, a morning treat like a donut or special breakfast left behind from the tooth fairy is sure to put a smile on your child’s face. But make sure they brush after! Instill a love of learning in your child by giving them a book for each tooth lost in childhood. You can even continue the tradition for each tooth going forward. If you enjoy crafts, consider making a beaded necklace or bracelet that your child can wear to show off what the tooth fairy left them. Remember to stay on top of your child’s dental needs by scheduling their bi-annual cleans with our dentist Melbourne CBD to ensure their mouth is healthy and that there is enough room for their adult teeth to come in. 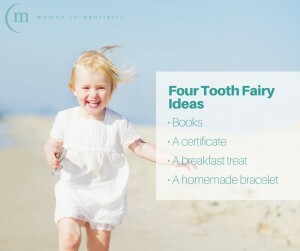 If you have other tooth fairy ideas that you love, feel free to comment below! We look forward to seeing you at our practice!